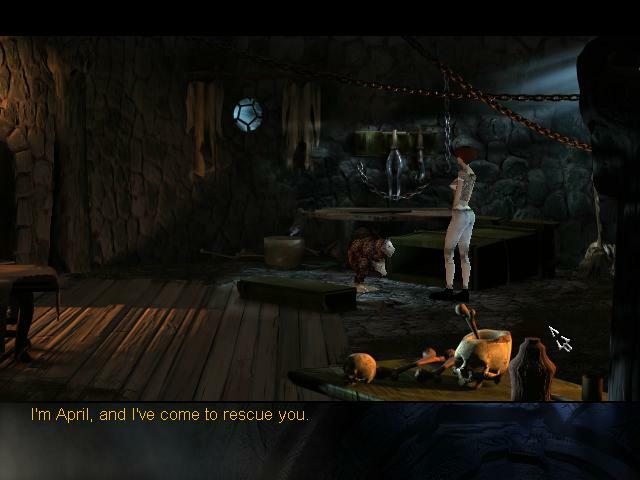 It has a very high reputation among adventure games. It’s certainly very pretty, the acting is top notch, and there are some great moments of humor. Ragnar Tørnquist likes female characters and April Ryan is fun; she’ll offer sarcastic comments about the scenery and express a good deal of Frodo-like reluctance to get on with saving the world. Still, she’s ready for most everything. It’s from 1999, which definitely shows. The character models are primitive, and though the game seems to be 3-d-modelled, the action takes place in static scenes, which is unattractively retro and leads to a lot of time spent watching tiny figures of April Ryan running. You have to save the world… two worlds, actually. I have to say I don’t care much for Tørnquist’s cosmology. Magic vs. Science is better than the usual dark lords, but it feels wrong to me somehow, perhaps because “magic” isn’t something we can actually believe in, which makes all the stuff people say about it a little too artificial. Plus, I dunno, does every fantasy plot have to make the heroine the One Spoken Of In The Prophecies? Beyond that, I think the basic format of the adventure game needs some jazzing up. It’s mostly watching talking heads, alternating with trying out your inventory of miscellaneous junk on the obstinate devices on the screen. It’s a pretty limited repertoire for storytelling. Beyond Good & Evil managed to get beyond this by keeping the cutscenes very short and piling on a diversity of types of gameplay. Anyway, sorry to be cranky about it. I’ve been thinking a lot about what makes games fun to play or not. On that note, in fact, this interview with the developer of Borderlands is interesting. I like the bits about guiding gameplay without making it feel like you’re doing so, and about making the player’s motivation match the character’s; also about whether the player feels like going along with the developer’s ideas or not. Some games encourage non-linear exploration, but it’s probably a bad thing if what the game is offering you is not that exciting. Maybe I’ll go design the perfect video game… back later.